Eric Cantona’s recent announcement that he would be running in next year’s French presidential elections didn’t even cause me to raise an eyebrow in Ancelotti-esque fashion. When it was stated just a day later that his announcement was nothing more than a ruse to get actual candidates to pay attention to his push for better housing for the poor, I was even less surprised. would you elect this man to lead your country? 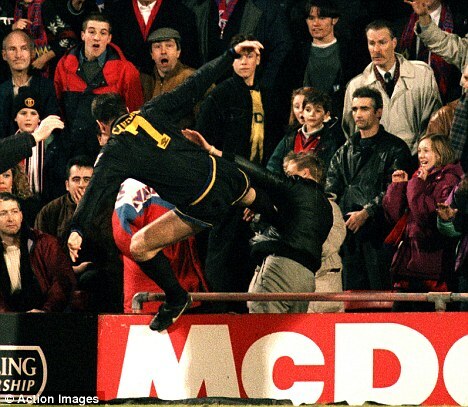 The moves were textbook Cantona: unpredictably predictable. Whether it be from decades of grilling by the media, or from years of shelling product for Nike / Umbro / the Cosmos, the often polarizing Frenchman has picked up a good deal of media savy. And he knows how to use it for his unpredictable bidding. His announcement was a perfectly timed way to get the political punditry, candidates and general populace all at least discussing his pet cause. Shrewd work, however you look at the announcements. But the more I think about it, the more I think that the former football bad boy could present an intriguing option in today’s tumultuous European political climate. Assuming, of course, that he really was to making a run at the French presidency. Now let’s get one thing straight before we get too far into this: I am by no means any sort of political analyst. While I have a passing interest in politics, I’m hardly familiar enough with the Europe’s political happenings to comment on who is or isn’t most prepared and well-suited for running one of the world’s most influential countries. And if you’ve spent any time reading this blog, you know that I rarely know what I’m talking about regarding football… so take everything below with a Napoleon-sized grain of salt. But don’t discount Cantona as a viable “hypothetical” candidate just because of my political naivety. The most common complaint that sprang up in the aftermath of the announcement was that King Eric’s celebrity status was the only reason he could even enter the discussion in the first place. “Everyone knows celebrities don’t make politicians.” Unfortunately, that’s a pretty weak argument. Plenty of celebrity figures with little experience in public office have been able to find their ways to seats of power. I mean if Arnold Schwarzenegger — a body-building, Austrian immigrant turned movie star who’s lines were often limited in complexity to make them easier for him to say — was able to run the world’s eighth largest economy decently enough, there’s no reason to believe that a footballer couldn’t do the same. Hell, there’s plenty of precedent to make that claim as well. The man best known for netting 64 goals for Manchester United, popped collars, and kung-fu kicking a fan during a match is — as mentioned earlier — also rather well known for his spontaneity. While many star players from yesteryear tend to take a career in football management, move into the punditry, or just fade into obscurity, Cantona chose a path slightly different… acting. Though none of his performances have garnered any sort of critical acclaim, the career move has gone a long way to endearing him to a wider audience. Which is obviously crucial for anyone attempting a run at the presidency, as football fans alone cannot a president make. So aside from a growing fan base, what is it about Cantona that has convinced me that he could be a candidate at least worthy of consideration? The issues, of course. cartoonist pete mckee hit the nail on the head with his assessment of cantona's strength in france's upcomming elections. One of the biggest issues plaguing France at the moment is the backlash against the supposed erosion of French culture by means of immigration. The country has spent the better part of the last decade attempting to figure out assimilate the masses of immigrants into French culture, instead of having the varying cultures slowly erode the country’s proud national identity. The issue is pervasive across French society. You might recall the French national team’s controversial “policy” that aimed at limiting the number of dual-nationality African players being drafted into France squads in favor of increasing “traditional French” players. Who better to lead a country caught in this battle than a mad who embodies both characteristics? Cantona’s heritage — his mother’s family is from Catalonia, while his father’s from Sardinia — makes him the ideal spokesman for dealing with the integration issue. His family’s immigrant background would not only gain him the support of France’s growing immigrant population, but also to better understand their needs better than someone stemming from the bourgeoisie. Perhaps Eric’s efforts to bring better housing to the poor are rooted in his family’s meager roots: his stonemason grandfather and father carved their home into a Marseille hillside around the freaking cave in which they had been living. Likewise, Cantona being a second-generation Frenchman means he seems like a “normal” Frenchman… or at least one traditional enough to appeal to the “normal” French people. He looks French, if nothing else. Next year’s French presidential elections won’t just focus on the country’s racial tensions, though. While that will surely play it’s part during the course of the campaign, the biggest issue will undoubtedly be the economic crisis that’s currently plaguing the European Union. And surprisingly, Eric seems like the perfect candidate to tie France’s socio-economic classes together on this front, too. I mentioned earlier that he’s already championing efforts for the poor, and that his family’s former days in the cave-dwelling lower class, so he’s got the plebian vote accounted for. And because of his middle-class upbringing in and around the 1981 global recession, he’ll understand how Europe’s economic downturn is affecting today’s stagnant and struggling middle class. He’s also rich: works-on-three-continents rich. And there’s nobody that rich people trust more than other rich people. Generalizations? Sure, but Cantona’s economic bridging at least smells like a classic Michael Scott “Win-Win-Win” scenario. if king eric were to run for president, any political opponents might want to watch what they say about him. Anyone ballsy enough to deliver that kind of gibberish to a room full of journalists has more than enough personality and mental toughness to handle running a country. Not to mention that he’d be just as likely to harpoon one of his political foes as he did to Palace fan Matthew Simmons in 1995. Not that any of these quality reasons are of any importance anyway, since Cantona’s team has already announced he’s not actually running. I hesitate to even venture a guess at what kind of cockamamie initiatives he would have dreamed up on which he would have run his campaign platform. Whether he could have gotten enough people to take those ideas seriously is another matter all together. Would I vote for Cantona? It’s kind of a moot question, seeing as how I lack any sort of French citizenship. But if only we could find a way for him to get on the US presidential ballot — I’m just playing a red devil‘s advocate here — that might just get my vote. I mean, Cantona 2012 can’t be any worse than any of our other options anyway, right?